The Newport 471-A Large Rotation Stage has a central aperture of 3-1/8", allowing the mounting of larger optics. The ball-bearing movement can be adjusted through the full 360 degrees, and then locked so the final fine positioning can be done with the Newport micrometer actuator. Ideal for larger polarizing optics. This can be used in both the vertical and horizontal position. 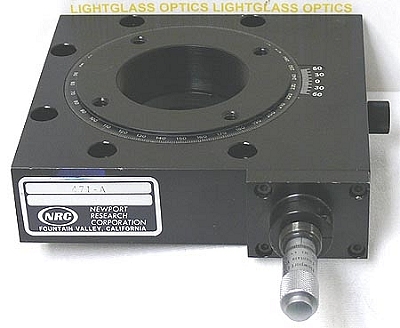 Lightglass optics has the solid platform inserts to allow the user to make their own custom holders or just use this as a larger platform rotation stage.